Normalised PBT €7.2m compared to €3.5m in 2017. Our Value added S-Europe division which includes the acquired operations of Icelandic Iberica in Spain and Argentina and Iceland Seafood Spain, saw good growth in 2018. Sales of the division in 2018 including Icelandic Iberica numbers from mid-September, were €100.1m and Normalised PBT €3.5m. On a proforma basis, sales were €179.5m compared to €172.9m last year and PBT €6.7m up 7% on 2017 Proforma numbers. The key drivers of the growth were increased sales of lightly salted cod products and significant increase in profitability from production of Argentinian shrimp from 2017. The business sold 15.200 MT of lightly salted cod products in 2018, 7% increase from the year before and the profits in Argentina grew by 30% from prior year. Successful product development in Spain over the last 25 years has turned Spain into Iceland’s most important cod market. As announced in February, the work of merging Icelandic Iberica and Iceland Seafood Spain has now started. The two will form one organization with a strong brand and product recognition in the market, highly qualified people and a loyal customer base. An experienced management team has been put in place for the merged entity, led by Magnus B Jonsson who joined Iceland Seafood Spain as a Managing Director in 2006 after having worked as Commercial Director at Icelandic Iberica for 10 years. Our Value added N-Europe division includes Oceanpath, the largest fresh seafood processor to Irish retailers, which was acquired mid-March 2018 and our two UK Companies Iceland Seafood Barraclough and Havelok. The division saw significant growth from prior year. Sales of €97.4m were up 73% from 2017, thereof 53% relates to Oceanpath. Normalised PBT of €4.6m increased by €3.1m from last year, largely due to Oceanpath but improved sales and higher margin products within UK Foodservice also contributed to the growth. We are now finalizing an extension of the fresh fish production facility of Oceanpath and investing in new machinery which will improve automation within the business. The extension and the new machinery are expected to be fully up and running from July this year. These investments will improve efficiency within the business and support further growth. The Sales & Distribution division had a challenging year in 2018. Sales of 183.2m grew by 11% from prior year, mainly due to higher sales of Pelagic and FAS (frozen at sea) products out of Iceland. The fisherman strike in 2017 also impacts comparison to prior year. Despite the sales growth, there was a slight €0.3m reduction in Normalised PBT from prior year, due to more challenging environment for higher margin fresh fish sales, both in Iceland and France and slight increase in finance cost, partly FX related. We are actively working on several opportunities with producers in Iceland, where our unique sales platform with network of 3000 customers in 45 different countries is a key and we belief the outlook for this division is good for 2019. Year on year total assets increased by €105.6m to €193.8m at year end 2018, due to the two acquisitions made during the year. At the same time, the balance sheet of the business has strengthened considerably, equity ratio at year end was 30.6% compared to 20.1% at end of 2017. The company issued 1,025m new shares in relation to the acquisition of Solo Seafood in September 2018, which is a key contributor to the improved equity ratio. The new shares represent about 44,1% of current outstanding shares. In December 2018, the Board of Directors formally agreed to prepare for a listing of the company’s shares on Iceland’s Nasdaq Main Market during the course of 2019. The management of the company has started preparation for the listing, with the aim of finalising it in Q4 this year. In relation to this, the Board of Directors have agreed to set a dividend policy that will take effect from the listing, where the company will pay 20-40% of PAT annually as dividend. At the same time the targeted equity ratio will be set at 35%, this target shall be reached within the next three years. As part of the recruitment agreement with Bjarni Ármannsson, CEO for the Group it was agreed to grant him two months of leave of absence on personal grounds, from end of March 2019. During his absence Reynir Jónsson, CFO of the group will substitute him as CEO. 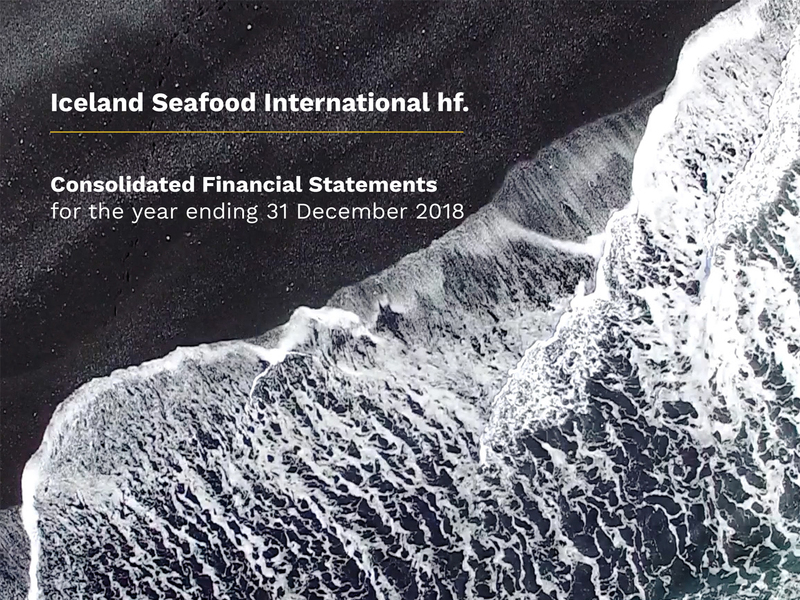 On March 21st at 8.30 am, Iceland Seafood International hf will host a meeting for market participants and investors, where management will present and discuss the 2018 results. The meeting will be held at the Company’s premises at Köllunarklettsvegur 2 in Reykjavík. This announcement is furnished and intended for European market participants and should be viewed in that manner. Any potential forward looking statements contained in this announcement are reflective of management's current views on future events and performance, whilst the views are based on positions that management believes are reasonable there is no assurances that these events and views will be achieved. Forward looking views naturally involve uncertainties and risk and consequently actual results may differ to the statements or views expressed.